1 1/2 lb. Irish Whiskey Cake made with Jameson Irish Whiskey. Made from traditional Irish recipes, this moist cake is made from a rich buttery batter with golden raisins and English walnuts, a hint of lemon zest and cloves. A generous portion of Jameson Irish Whiskey in the batter makes this a true whiskey cake. 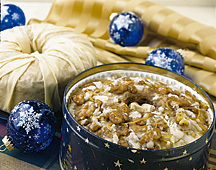 This cake is beautifully decorated with icing and walnuts and packaged in a decorative tin with a ribbon and gift card.